In a small bowl, combine black pepper, salt, sage, Italian seasoning, garlic powder and onion powder. In a medium bowl, combine 2 tablespoons of spice mixture, 2 tablespoons of vegetable oil, onion, yellow squash and celery. Toss to coat. Place vegetables in the bottom of a roasting pan. Rub the chicken quarters with the remaining 2 tablespoons of vegetable oil and liberally spice the chicken quarters with rest of spice mixture. Place the chicken quarters with skin side up on top of vegetables. Pour canned chicken broth on bottom of pan. Place roasting pan in oven for 25 minutes. Preheat a foil-lined baking sheet in the oven. In a medium bowl, toss potatoes in olive oil. Season to taste with salt and pepper. Place potatoes on baking sheet and roast for 20 minutes. 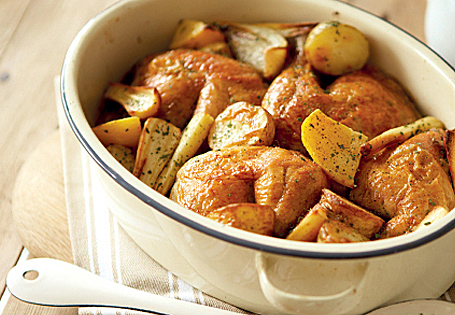 Remove roasting pan from the oven and arrange the potatoes around the pan, spooning any juices back over the chicken and potatoes. Return roasting pan to the oven and cook for 20 minutes until the internal temperature of the chicken thigh is 165°. Serve with your favorite gravy!